The Toy Fox Terrier is small, but mighty! Learn more about these spirited dogs that make such versatile companions. A descendent of the Smooth Fox Terrier, the Toy Fox Terrier is the product of a planned breeding program focused on reducing Smoothes down in size. To this end, Smooth Fox Terriers were interbred with a variety of small breeds with similar or desirable characteristics. These included the Italian Greyhound, the Miniature Pinscher and the Chihuahua to name a few. This program, begun in the USA around 1930, resulted in producing a spunky little Terrier that is just as at home on your lap as he is chasing vermin or running an agility course. Lively and intelligent, this little Terrier is extremely balanced with good muscle tone and clean, athletic lines. He stands nine to eleven inches tall on average, and his weight should be proportionate to his frame so that he is neither skinny nor bulky. The Toy Fox Terrier's head is reminiscent of his Min Pin heritage, but his erect ears are similar to the Chihuahua although held higher on the head. The body is distinctly Terrier in type, rather square and well-muscled, with just a bit more bone density than the average Toy dog. The tail is traditionally docked and is held nearly straight up when the dog is at attention. A predominantly white-bodied dog, the breed characteristically has a fairly dark, solid-color head with lighter markings over the eyes, on the cheeks and inside the ears. Some specimens display a thin blaze between the eyes. Some color on the body is permissible, but the white body is highly desirable according to the breed's standard. The coat is very smooth and quite glossy. 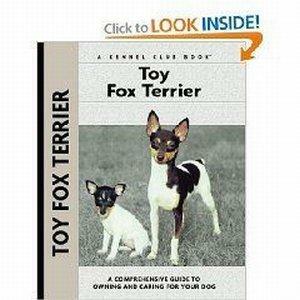 As cute as the Toy Fox Terrier is, it is his personality that is really his most attractive trait. This dog literally has boundless energy and brain power to match. Although he can't escape displaying typical Terrier scrappiness when the situation calls for it, his Toy dog heritage tempers that abundant spirit quite nicely. He's up for action when you are, but he's also willing to snuggle in your lap. His early history as a rodent chaser will definitely inspire this dog to see it as his duty to tree every squirrel in the neighborhood. He'll likely also want to chase away stray cats, so keep an especially close eye on him with other small pets.Unlike some Toy dogs, this breed also makes a surprisingly good companion for children, as long as those children understand the proper way to handle a dog. Some pets are easily worn out by a child's constant attention, but the Toy Fox actually seems to thrive on the relationship and become quite devoted to his little person. Being quite alert, this dog is also a wonderful companion to adults and seniors as well. Smart as a whip, there is really almost nothing you can't train this breed to do. They housebreak as well or better than many Terrier breeds. However, they really shine in obedience training and sportsmanship. Small, muscular and extremely energetic, these dogs can excel in canine agility as well as fly ball. They are also surprisingly good with a Frisbee as long as you provide them with the appropriately sized model. Keen intelligence and a tendency toward devotion also make this dog suitable for service training with some becoming helpers to the hearing-impaired as well as therapy dogs who visit the sick and the elderly. The grooming needs of this breed are not very demanding. They are moderate shedders, so a quick brushing with a firm bristle brush twice a week should remove excess hair. The nails grow quickly, and will need to be trimmed approximately every two weeks unless the dog has ample opportunity to wear them down on his own. The ears require the most attention and should be swabbed out every one to two weeks to keep them in top condition. Bathing should be carried out as needed, especially since these dogs have so much white fur, but with such a short coat, this takes very little time to accomplish. AS mentioned previously, the Toy Fox Terrier is a bundle of energy, so it's recommend that he receives daily exercise to burn off the excess. This can be accomplished with a brisk 20 minute daily walk, as well as a rollicking game of Frisbee or fetch. These hardy little dogs are known to easily reach their teens with 15 years being the average life span. Most specimens remain quite spry throughout their senior years. Food allergies are somewhat common, so watch for skin rashes as an early sign.